Ruled by President Robert Mugabe and his ZANU PF party Zimbabwe is once again at the brink of economic collapse. Despite the financial support of the IMF/World Bank and revenue from diamond resources the government has not been able to sustain the economy and corruption has reached a record high. At 92 and after 36 years of rule Mugabe is now facing the most challenging insurrections since independence. Zimbabweans at home and in the diaspora have decided to voice out and say #enoughisenough. New activist groups and individuals are using the internet to mobilize people under various hashtags such as #thisflag, #tajamuka, or #bangthepots and call for protests and demonstrations including the recent shutdown of Zimbabwe. The government’s response to these constitutionally legal protests and demonstrations was characterized by violence, detention and police brutality. 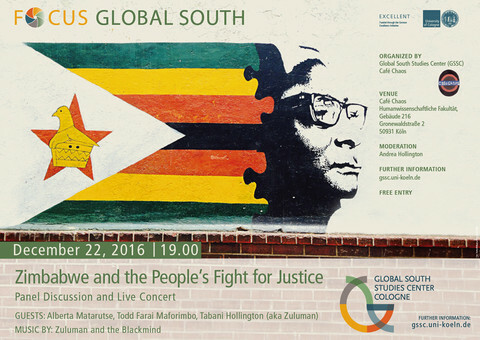 This Fokus Global South event will feature a panel discussion with three activists and aims at informing a German audience about the current situation in Zimbabwe and creating awareness. After the discussion there will be a concert with live music. 2. Todd Farai Maforimbo, an activist serves as a bridge between Zimbabwe and the diaspora through his online activism.